For other uses, see Veterans Day (disambiguation). Veterans Day (originally known as Armistice Day) is an official United States public holiday observed annually on November 11, for honoring military veterans, that is, persons who have served in the United States Armed Forces. It coincides with other holidays including Armistice Day and Remembrance Day which are celebrated in other countries that mark the anniversary of the end of World War I. 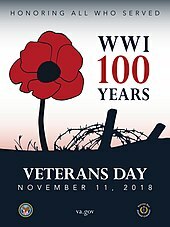 Major hostilities of World War I were formally ended at the 11th hour of the 11th day of the 11th month of 1918, when the Armistice with Germany went into effect. At the urging of major U.S. veteran organizations, Armistice Day was renamed Veterans Day in 1954. To us in America the reflections of Armistice Day will be filled with solemn pride in the heroism of those who died in the country's service, and with gratitude for the victory, both because of the thing from which it has freed us and because of the opportunity it has given America to show her sympathy with peace and justice in the councils of nations. The United States Congress adopted a resolution on June 4, 1926, requesting that President Calvin Coolidge issue annual proclamations calling for the observance of November 11 with appropriate ceremonies. A Congressional Act (52 Stat. 351; 5 U.S. Code, Sec. 87a) approved May 13, 1938, made November 11 in each year a legal holiday: "a day to be dedicated to the cause of world peace and to be thereafter celebrated and known as 'Armistice Day'." Congress amended the bill on June 1, 1954, replacing "Armistice" with "Veterans," and it has been known as Veterans Day since. Because it is a federal holiday, some American workers and many students have Veterans Day off from work or school. When Veterans Day falls on a Saturday then either Saturday or the preceding Friday may be designated as the holiday, whereas if it falls on a Sunday it is typically observed on the following Monday. When it falls on weekend many private companies offer it as a floating holiday where employee can choose some other day. A Society for Human Resource Management poll in 2010 found that 21 percent of employers planned to observe the holiday in 2011. Non-essential federal government offices are closed. No mail is delivered. All federal workers are paid for the holiday; those who are required to work on the holiday sometimes receive holiday pay for that day in addition to their wages. In his Armistice Day address to Congress, Wilson was sensitive to the psychological toll of the lean War years: "Hunger does not breed reform; it breeds madness," he remarked. As Veterans Day and the birthday of the United States Marine Corps (November 10, 1775) are only one day apart, that branch of the Armed Forces customarily observes both occasions as a 96-hour liberty period. Election Day is a regular working day, while Veterans Day, which typically falls the following week, is a federal holiday. The National Commission on Federal Election Reform called for the holidays to be merged, so citizens can have a day off to vote. They state this as a way to honor voting by exercising democratic rights. While the holiday is commonly printed as Veteran's Day or Veterans' Day in calendars and advertisements (spellings that are grammatically acceptable), the United States Department of Veterans Affairs website states that the attributive (no apostrophe) rather than the possessive case is the official spelling "because it is not a day that 'belongs' to veterans, it is a day for honoring all veterans." ^ Kelber, Sarah Kickler (May 28, 2012). "Today is not Veterans Day". Baltimore Sun. Retrieved October 21, 2013. ^ a b "Supplement to the Messages and Papers of the Presidents: Covering the Second Term of Woodrow Wilson, March 4, 1917, to March 4, 1921". Bureau of National Literature. November 11, 2015. ^ "Veterans Day History". Veteran's Affairs. Retrieved November 12, 2013. ^ Zurski, Ken (November 11, 2016). "Raymond Weeks: The Father of Veterans Day". Unremembered History. Retrieved November 9, 2017. ^ Carter, Julie (November 2003). "Where Veterans Day began". VFW Magazine. 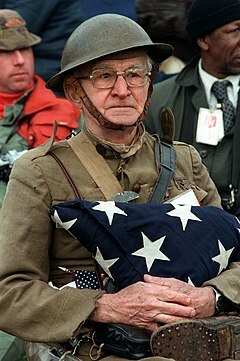 Veterans of Foreign Wars of the United States. Archived from the original on July 14, 2012. ^ "History of Veterans Day". United States Department of Veterans Affairs. November 26, 2007. Archived from the original on July 28, 2006. Retrieved November 6, 2008. ^ "The History of Veterans Day". United States Army Center of Military History (CMH). October 3, 2003. Retrieved November 1, 2007. ^ Society for Human Resource Management (November 4, 2010). "2011 Holiday Schedules SHRM Poll". Archived from the original on December 4, 2010. ^ Smith, Andrew F. (2007). The Oxford companion to American food and drink. New York: Oxford University Press, Inc. p. 290. ISBN 0-19-530796-8. Retrieved November 12, 2010. ^ Sutter, John D. (November 12, 2012). "Election Day should be a federal holiday". CNN. Retrieved October 20, 2016. ^ Veterans Day Frequently Asked Questions, Office of Public Affairs, U.S. Department of Veterans Affairs. Updated July 20, 2015. Retrieved November 8, 2015.